Using a hand powered ice auger is not about doing things the “old way”. With new lightweight designs, strong materials, and removable blades, these are not your Grandad’s augers. 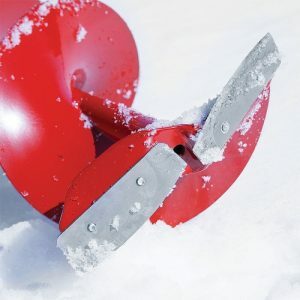 Today’s top hand ice augers are engineered to be surpassingly efficient hole cutters. Hand augers are affordable, highly portable, and should be a tool in every ice angler’s toolbox. We’ve reviewed the market to find the best hand ice augers, and have a pick for every angler and budget. The Nils High-Velocity auger is our top choice for its unmatched ability to drill holes quickly with minimal effort. Can it Handle a Cordless Drill? Nils High-Velocity Hand Auger – Editors Choice, best overall hand auger. Nils Convertible Hand Auger – Easily converts from hand to cordless drill powered. StrikeMaster Lazer Hand Auger – Affordable alternative to the Nils. Eskimo Barracuda Hand Auger – Good cheap hand auger. StrikeMaster Mora Ice Auger – Budget ice auger for the occasional ice fisherman. Most hand augers have three sizes to choose from (4.5”, 6”, 8”), so how do you choose? Obviously, the bigger the hole, the longer it takes to drill. This is important when you are drilling multiple holes per day, especially through thick ice. A 6” diameter hole is perfect for most ice fishing applications. 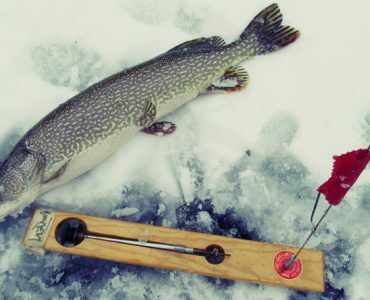 All but the biggest fish, such as big lake trout or pike, will easily fit through a 6-inch hole. Anglers who focus on panfish would be well suited with a 4-5” auger. If you insist on an 8-inch hole, make sure you get an auger with blades that can be sharpened to make your drilling as efficient as possible. One nice benefit to a hand auger is the lighter weight. 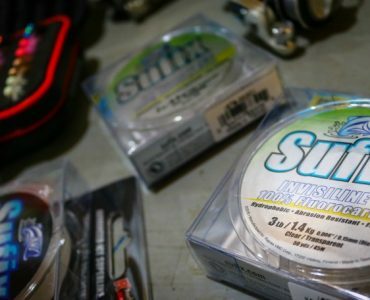 When fishing early or late ice, weight is an important safety consideration. The smaller the diameter, the lighter the auger will be, and safer to haul onto the ice. Most hand ice augers now come with removable blades. Dull blades can be sharpened or replaced while on the ice, potentially saving you from frustratingly slow hole drilling. Serrated blades are awesome for cutting ice. The small teeth have more surface area to chip away at the ice with less effort. Having adjustable height on your auger allows for two things. First, you can adjust for thicker ice, while keeping the handles at a comfortable height. Second, you can easily adjust for your personal height. Getting the handles at the right level makes it easier to start holes and limit arm fatigue over the course of drilling many holes. 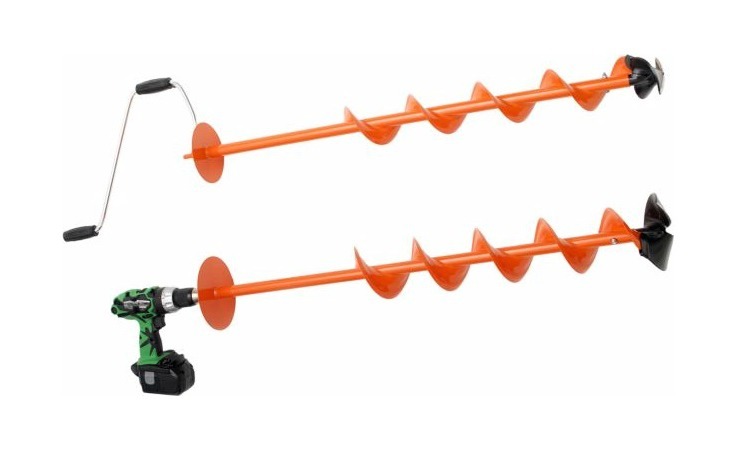 Only one model we reviewed (see below) can convert to a cordless drill powered auger. You do pay a premium for that feature, but to many ice anglers it is worth the price when you can drill a dozen holes on one drill battery. Besides, it still costs a fraction of an electric or gas/propane powered auger. After collecting data from multiple eCommerce shops and ice fishing forums, these are the Top 5 models you should consider. Each auger will get a recommendation who it’s best for, along with some pros and cons. Overall, the Nils and StrikeMaster Lazer rate highly, while Eskimo Barracuda is an excellent budget offering. 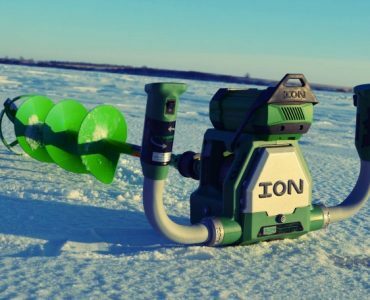 Best For: Anglers looking for the best hand ice auger for the money. Period. Pros: A lightweight, efficient auger with a proven design. This auger simply works! Cons: Some people have had trouble with the cover fitting over the head. The Nils High Velocity auger is one of the most popular hand augers of all time. It is a lightweight (6” weighs less than 10 pounds) and efficient hole drilling machine. The auger blade is 47” long, and 57” total length. The offset handles are the most unique feature about this auger. Most other augers have you put one hand on top for pressure, and drill with the other. The Nils top handle is offset from center, meaning it requires you to move both hands in unison to drill. This is the secret sauce to high speed hole drilling. Once you get over the learning curve, you can really get that blade moving fast, meaning faster holes with less effort. Best For: Ice anglers who want the best of both a hand auger and a cordless drill auger. Pros: Cuts extremely well as a hand auger, and drills dozens of holes on one battery charge. Cons: Auger length is not adjustable. Ice shavings can collect and freeze in the cutter on colder days. Most owners have reported drilling over 20 holes on an 18V drill, and 40 on a 20V. Be sure to use the drill on the highest torque and lowest speed settings so you don’t burn up the motor. There is a large disc near the cranking point that prevents the auger from falling into hole if drill comes loose. The handle can also fold down for easy storage and transportation. Best For: Anglers who want a good primary or back up auger priced below the Nils. Pros: 5 sizes, adjustable length, replaceable stainless-steel blades. Cons: The stock blades may not last the longest, but the Swedish made replacement blades are excellent. The StrikeMaster Lazer is a solid hand auger, and a good alternative to the Nils. This auger is powder coated, and has an extendable handle to adjust for thick ice. The handle simply slides into the main shaft tubing and secures with a T-handle. The Lazer can be bought in 5 different sizes, from 4 to 8 inches, but only the 7 and 8 inch versions have a reinforced blade carriage. That’s not a big deal because out of the box, the Lazer cuts ice without much effort. It’s important to note our “out of the box” comment, because the key issue with the Lazer is the blades. The stock blades are pretty average, and tend to dull rather quickly. It could be because they are made in China? Sure, you can buy the made in Sweden replacement blades, but when you factor in that cost you might as well have gotten a Nils High Velocity auger for a similar total cost. Best For: The occasional ice angler who simply wants the best cheap ice auger. Pros: Good quality for a low-cost hand auger. 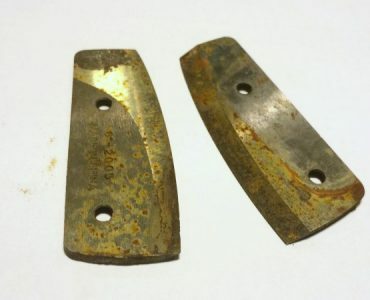 Sharp, replaceable stainless-steel blades. Cons: Only available in the most popular 6” and 8” sizes. The Barracuda is an excellent entry level ice auger that can also serve as a cheap backup to a battery powered auger. 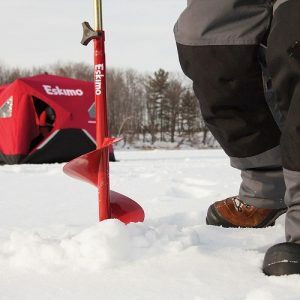 It is a no frills auger, but certainly drills ice well enough to get you fishing. Without any extra features, the Barracuda weighs just 6.5lbs. 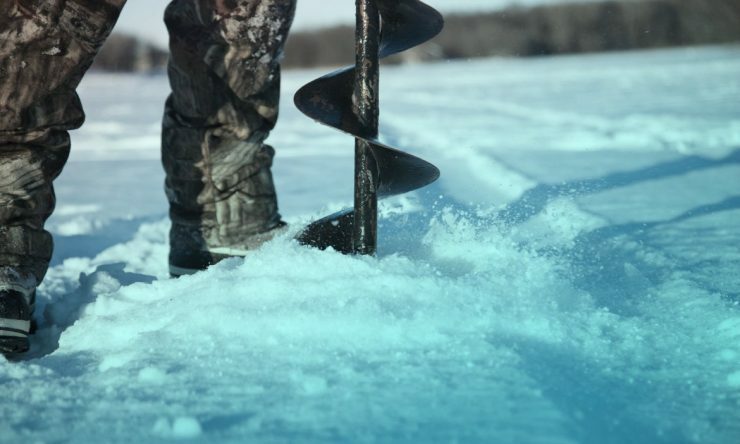 If you like to hike into remote lakes to ice fish, this could be the auger for you. Compared to the Mora, the Eskimo has the better blades (stainless vs carbon steel). Both have extending handles, 49″ – 58″ for the Eskimo, and 48″ – 57″ for the Mora. They are very similar, but the Barracuda gets the nod from us for its superior cutting blades. Best For: Good cheap ice auger for beginners, and budget minded anglers. Cons: Carbon steel Blades can get dull quickly if you’re not careful. The Mora is another good low-cost auger that would be a good choice for beginners. The 6” size weighs just 6lbs, and the 8” only 8lbs. The removable handle makes it a good choice for pack in fishing trips where keeping weight low is important. If you can’t decide between the Mora or Barracuda, don’t worry too much about it, they are both good. So pick one you like best, and get ready to go ice fishing! Struggling with a hand auger is not fun, especially if you watch your buddy zip through with his gas-powered auger. Here are some quick tips for keeping your hand auger at peak performance. Keep a spare set of blades in your ice fishing gear, along with the tools needed to replace them. This is a simple precaution that can save your trip someday. Keep your auger blades clean and dry after your trips to prevent corrosion on the cutting edges. Be careful with the razor-sharp blades. Then apply a light coat of oil on the blades. Your auger came with a blade guard, so use it! The guard extends the sharpness of your blades and is important for preventing cuts. When your blades become dull, make certain you know the right way to sharpen them, bring them to a professional, or simply replace them with a new set.